Miles change you, and when you share those miles with someone, they change your relationship. Running with your spouse can further improve your relationship; most of us have experienced how running with someone produces deep conversations and fosters meaningful bonds. However if you approach it with the wrong mentality, more things can go wrong than right, which is not exactly what you want for your marriage. Ryan and I have run together throughout our nearly two years of marriage, especially now that we have access to miles of running trails and ideal running weather year-round. I love our runs together – the miles go by faster and it’s a great way to bond and support each other. The slower runner picks the pace when you run together. 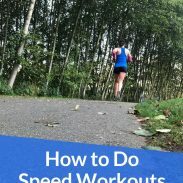 Running too fast changes the purpose of the workout for one person, as you will still reap the same physiological benefits of an easy run whether it’s 1 minute or 3 minutes slower than your goal race pace. So run together on your easy days – and keep the pace easy for both people. This means chiming in if one person pushes the pace too fast – there’s no shame in running slow. Plus, an easy pace means that you have the breath to talk and enjoy some good conversation – which isn’t that half of the fun of running together? Even though you both planned on the pace before hand, we all know how hard it can be to settle into the prescribed pace on any given day. 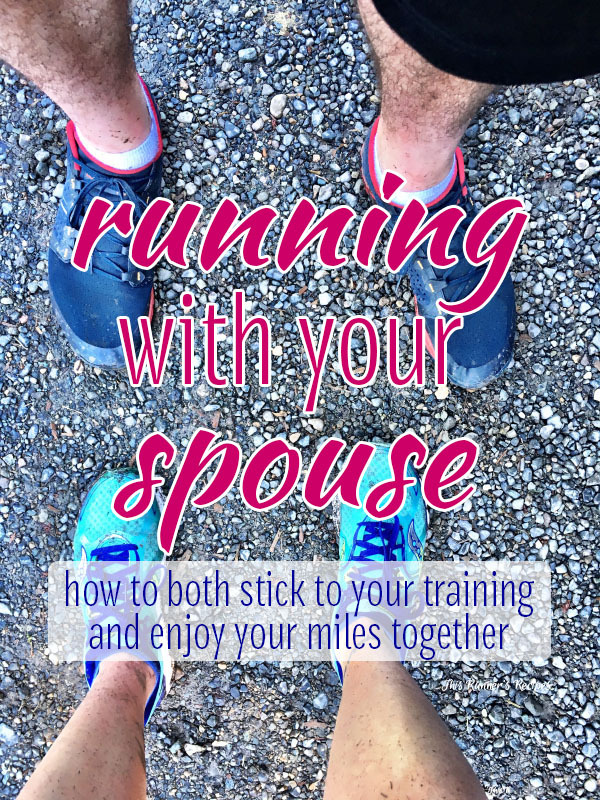 Both the faster and slower runner need to be patient with each other as you work on finding a middle ground pace that works well for you as a couple. Chances are, you and your significant other do not have identical race times, lactate thresholds, and VO2max. Even if you’ve run similar race times, one of you may excel at long distance running and the other thrives on shorter, faster workouts. Plus, it’s likely that you both have different goals: for example, Ryan is working on lowering his 5K time trial time while my goal is to run a marathon PR. Those are two very different goals which require very different workouts to elicit the particular physiological adaptations necessary for achieving those goals. Don’t sacrifice your goals, as that could lead to resentment. Instead, plan your runs together in a way that supports both of your goals – an easy run, long run for one of you, or recovery run where pace really doesn’t matter as long as it’s easy enough. For me this is just logical because I’m a planner by nature and Ryan’s coach, but don’t head out on a run together without a plan of how long, how far, the pace, and which route. If you have different distances planned, discuss this beforehand and begin from home or a familiar area and plan on looping back together before you head off on your own miles. Of course, running with your spouse only works if both of you want to run together. If your significant other doesn’t run, don’t try to force them into running. If one day per week works together for running, then stick to that routine rather than trying to altering both of your schedules completely to fit in daily miles together. Like marriage, running with your spouse will require some work, but not so much work that you both are miserable. Convenience: Especially if you married, your running partner is right there – no need to coordinate meet-up spots and times, you can just head out the door together! Honesty: Honesty is the basis of a healthy and strong relationship – both for a spouse and a running partner. You can honestly tell your spouse to slow down, quit whining, or push through a tough run without worrying about hurting their feelings (as long as you’re not actually mean about it). Adventure: I am more willing to try new trails with Ryan (not that I’m worried about safety out here…but I am worried about getting lost with how my brain gets confused about directions on a run). Not only does it feel safer, but it’s more fun to explore with your husband or wife than on your own. Motivation: You are far less likely to quit when you’re running with a partner! I really don’t care what others think of my running except for Ryan, because I want to make him proud with how hard I train. Comfort: Let’s face it…when you run with someone you have to be comfortable with farting, sweating, or making urgent bathroom stops with them. This certainly isn’t the most romantic thing, but at least with your spouse you have someone with whom you’re comfortable and can laugh about embarrassing moments. Bonding: The natural vulnerability of running often leads to honest, deep conversation. Especially if you and your spouse have busy schedules and kids, running can be an escape for just the two of you to catch up and reconnect. Do you run with your spouse? What advice would you offer? It’s so easy to become to feed off the other’s energy and push the pace a bit (or become a bit competitive at times). Running together is a great way to add variety to the routine of training, especially during times like marathon training when you feel like you’re running all of the time. I go back and forth on this one. My husband absolutely hates running and has only ever run with me once in the 13 years we have been together. And it was awful. It’s hard at times because he doesn’t “get it” and often thinks I train too much, etc. However, the positive side is that there is no struggle as to who is going to leave for a run and who is going to watch the kids (when my husband works out it’s at a gym with daycare so he brings them) and I can schedule races at will, without having to worry about him having a big race on the schedule. 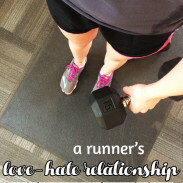 Great post and I’m so happy you and your husband have a happy and healthy running relationship!! I think keeping the hard workouts separate, and making sure that the runs that you do together are as enjoyable as possible is HUGE. SO HUGE. I love running with Alex, but it is hard for me at the moment–I have to run to keep up with him! SO huge indeed! That’s so awesome how you two run together and how you’re helping him prepare for his first race! I sometimes get Dan to run with me, but he really doesn’t like it. I’ve learned to let him run when he wants or he’ll end up resenting me AND hating running even more. Resentment is never good for a marriage. Sometimes you just need to keep hobbies separate – everyone has their preferred forms of exercise. That’s fun that you two can run together and awesome how you push each other in 5Ks! No specific pace requirements is the best solution – no pressure on either runner. Aww, I miss running with Andrew. 🙁 He is so busy with work right now! Real estate is INSANE. But hopefully one day we can get back to it. I’d time it so that I would do my tough runs the day before I help him do HIS tough runs so that I kinda knew what to expect and then I could help him mentally push through the intervals. Awwww! That’s sad that he’s currently too busy to run, but I know you two will find time for running together in the future 🙂 That is so incredibly sweet how you would do his hard workouts the day before so you could support him – I love that! Thank you! I imagine running together is harder with kids – but I bet it’ll be nice when you are finally able to run together! 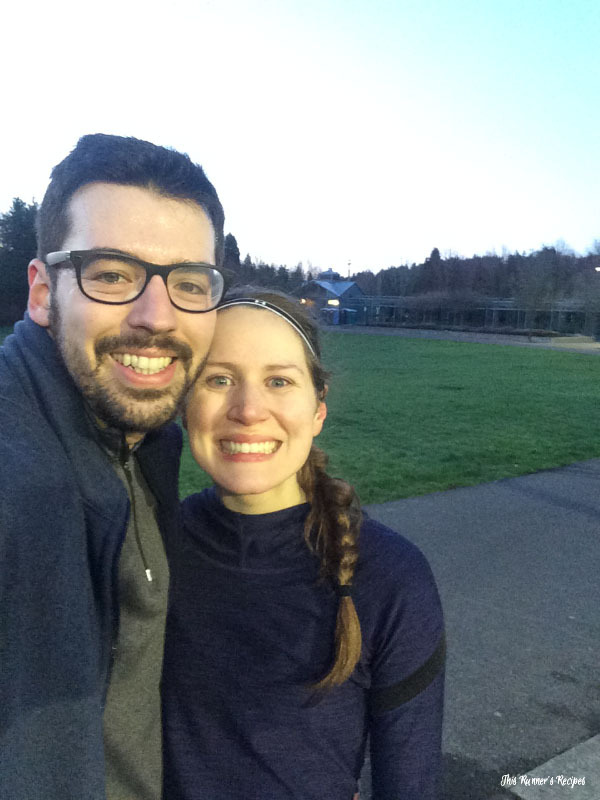 My husband and I have almost the exact opposite preferences for running…we really only run together(ish) when I find an afternoon or evening race and convince him to sign up with me. He recently started running on the treadmill at his work gym and says he prefers it to outdoor running, and my reaction is just – ???? So we stick to running separately. Treadmill vs outdoor is a big difference in running preferences – and it’s a bit hard to do treadmill runs together, even if you’re on side by side treadmills it’s more difficult to talk over the noise of the machines.